They build effective programs to select, develop, and retain talent. They engage, and invest in, all employees — from the executive suite to the shop floor — by giving them tools for solving problems and taking ownership of their roles. These organizations earn the reputation as an employer of choice. The most talented people want to work at these companies and the best employees want to stay. Catalyst Connection has developed services that can put any manufacturer on the right track to successful Organizational Development. Gain a competitive advantage by attracting and retaining valued and highly-skilled employees. Catalyst Connection can enhance leadership skills with innovative solutions designed to improve employee performance through coaching, communication, and problem-solving. Catalyst Connection can help identify key business drivers and break through objectives, and then cascade those goals down to the level of the individual contributor. Catalyst Connection helps regional manufacturers conduct a thorough audit of the current leadership team and potential future successors. 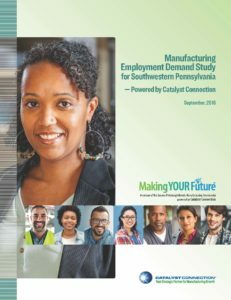 Click here to download the free Manufacturer Employment Demand Study to better understand the current and projected demand for workers and the skill sets sought after by the regions’ employers.